1-2-Switch is the perfect party game wherever you are. It employs Face-to-Face play, allowing you to face your friends, rather than the screen. You and your opponent use Joy-Con controllers to go head to head in this action packed game. Dance-offs, wild-west duels, and cow-milking competitions are just a few of the shenanigans. Friends (and onlookers) will have a good time watching the two players face off. The Joy-Con controllers use features like HD rumble, motion control, and the IR Motion Camera, depending on the game. 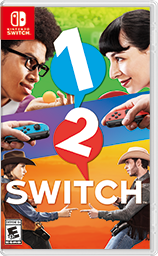 Where can I buy 1-2-Switch physical/digital?